We decided to spend the weekend in Boulder City Nevada after finding out they would be holding their annual Christmas Tree lighting and Santa’s Electric Night Parade while we were visiting the area. I have to tell you, I love a parade. Whether it be a big one like the Calgary Stampede Parade (my hometown parade yes, but you really should plan to make a visit) or a small town event where participants still throw candy to the kids, eagerly watching from their perches on curbs or parents’ shoulders, I’m a fan. 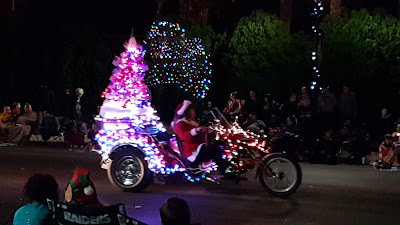 Santa’s Electric Night Parade did not disappoint. 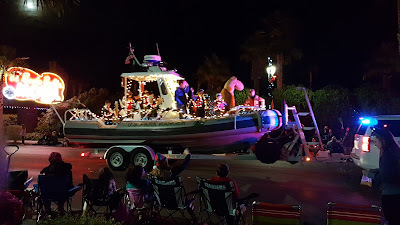 With over 80 entrees, the parade wound its way down historic Nevada Way, right in front of our hotel (the Best Western Hoover Dam.) Seeing that things were beginning to get crowded, Hubby headed out to the street with blankets to set out our ‘seats’ (we’ve done this a time or two) and chatted with some of the folks already lining the street. Parade goers tend to be a friendly group. By the time EJ and I joined him with our camera and some snacks, we could see the lights of the first entree heading toward us. 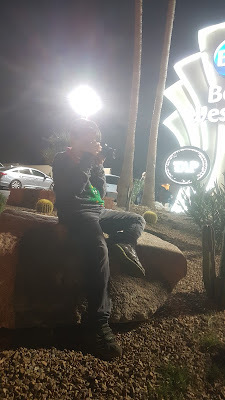 I tried to keep up with the official line-up from the Boulder City Chamber, but I soon gave up and started snapping pics and taking video with my phone (EJ had taken control of the DSLR) until the battery died. 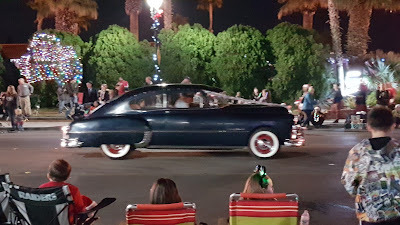 There were marching bands, walking groups, groups of jeeps, VWs, and vintage cars, plus local businesses, and the requisite politician thrown in for good measure. I was amazed at the size of the crowd lining the streets. There were vendors selling light sticks and hot cocoa and folks watching from streetside restaurant patios and balconies, creating a festive feeling for the night. 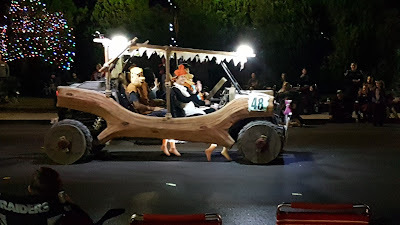 One of the highlights for the kids was the Star Wars land speeder. I did manage to get a video of that one. 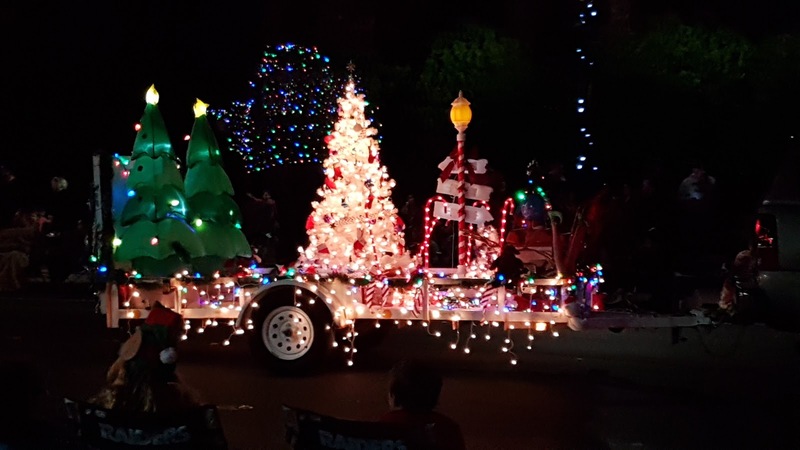 There were plenty of trailers (like the one below) that carried holiday displays. An amazing amount of work goes into it all. Santa’s Electric Night Parade in Boulder City Nevada is a lot of fun.